This was our second time on the MSC Seaside. 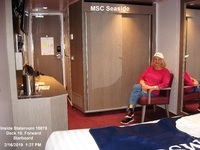 We had also cruised previously three times on the MSC Divina. We enjoyed everything about this cruise, and the best part of all was the warm and caring attitude of the Captain, the Senior Officers, and the staff that made of truly feel like we are part of the MSC Family. Both Captain Francesco di Palma, and Guest Services Manager, Carmelina Iuliano, remembered us from our Divina cruises, and greeted us like long-lost family members. I am sure that it is the Captain&apos;s wonderful attitude that filters down to all the onboard staff. He was very visible throughout the cruise. We also enjoyed the Black Card Party, and the Captain&apos;s Welcome Back Party. They were all very enjoyable. The Cruise Critic Party was very special. Captain di Palma was there along with his Senior Officers, and they all came around and spoke to us, plus they had cocktails, hors d&apos;oeuvres, and a beautiful cake. They took a group picture which we each received. It was really well done! We also met Hotel Services Director, Jordon Ozero, who was very caring and friendly to us throughout the cruise, and helped us with our disembarkation. We were also very impressed with Yesenia Figueroa, a very sweet server in Venchi, who brought us our daily milkshakes, and always made us feel welcome. Our interior stateroom, 10078, was located forward, starboard, and was very spacious. I chose it because it was one of the square staterooms, which appear to have more room. It was very cozy and quiet, and we slept very well. We enjoyed our afternoon naps. Another thing we really liked were the Trivia contests. As others have stated, MSC gives out the best prizes of any cruiseline. We enjoyed all of our meals, either at the buffet on Deck 8, in the Ipanema Dining Room, and once at Butcher&apos;s Cut. The MSC Seaside is a beautiful ship with many fun places to explore and enjoy. We particularly liked our time in the Aurea Spa Thermal Suite, especially the Snow Room! We did not take any shore excursions, since we have been to the ports many times. Thanks to all of the MSC people for making this one of our best cruises ever! 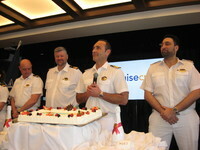 Wonderful cruise with warm and caring Captain, Senior Officers, and Staff! 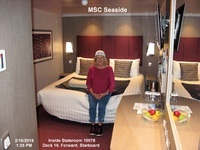 This was our second time on the MSC Seaside. 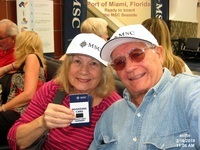 We had also cruised previously three times on the MSC Divina. 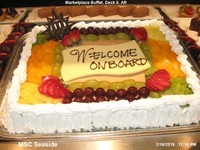 We enjoyed everything about this cruise, and the best part of all was the warm and caring attitude of the Captain, the Senior Officers, and the staff that made of truly feel like we are part of the MSC Family. Both Captain Francesco di Palma, and Guest Services Manager, Carmelina Iuliano, remembered us from our Divina cruises, and greeted us like long-lost family members. I am sure that it is the Captain&apos;s wonderful attitude that filters down to all the onboard staff. He was very visible throughout the cruise. We also enjoyed the Black Card Party, and the Captain&apos;s Welcome Back Party. They were all very enjoyable. The Cruise Critic Party was very special. Captain di Palma was there along with his Senior Officers, and they all came around and spoke to us, plus they had cocktails, hors d&apos;oeuvres, and a beautiful cake. They took a group picture which we each received. It was really well done! We also met Hotel Services Director, Jordon Ozero, who was very caring and friendly to us throughout the cruise, and helped us with our disembarkation. We were also very impressed with Yesenia Figueroa, a very sweet server in Venchi, who brought us our daily milkshakes, and always made us feel welcome. Our interior stateroom, 10078, was located forward, starboard, and was very spacious. I chose it because it was one of the square staterooms, which appear to have more room. It was very cozy and quiet, and we slept very well. We enjoyed our afternoon naps. Another thing we really liked were the Trivia contests. As others have stated, MSC gives out the best prizes of any cruiseline. We enjoyed all of our meals, either at the buffet on Deck 8, in the Ipanema Dining Room, and once at Butcher&apos;s Cut. The MSC Seaside is a beautiful ship with many fun places to explore and enjoy. 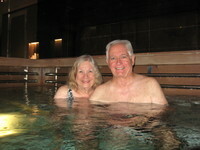 We particularly liked our time in the Aurea Spa Thermal Suite, especially the Snow Room! We did not take any shore excursions, since we have been to the ports many times. Thanks to all of the MSC people for making this one of our best cruises ever! Cabin 10078 is an interior cabin located forward and starboard. It is one of the square cabins which makes it appear to be more spacious than the more common rectangular shaped cabins. It was close to the forward elevators, and was very cozy and quiet. I highly recommend this cabin. Could be GREAT but isn't yet - and MSC knows it!